I made a long list of justifications and excuses for this post. Guilt has plagued me all weekend, no matter if the above ravioli have proved to be a quite respectable dish. 8) And then, Praguese coffee-shops in the heart of the Latino neighborhood, Chinese-Mexican take-aways, triple cappuccinos with no foam, tofu burgers and vegetarian steakhouses, garlic ice cream, Andalusian tiramisu and tea lattes. Boy, some things do leave a mark. Have pity on me. Although I don't think I got that far (see Number 5 and Number 7), guilt - I repeat - has haunted me for days, and I feel compelled to apologize. fresh peas, shelled about 250 gr. The idea is not mine, of course. I found it online by accident; if you do a search for "ravioli with won ton wrappers", Google will open up a whole new world. For the filling, blanch peas for a couple of minutes, drain and set aside. Cut the green onions into thin round slices and saute them in a pan with a little olive oil, add the peas, fresh mint, salt and pepper and cook for 3-4 minutes. Let it cool off, put everything in a blender with two tablespoons of grated parmigiano cheese and puree until smooth. To make ravioli, place few won ton wrappers on the work surface and scoop a teaspoon of filling in the middle of each. Brush the borders with cold water, then cover each wrapper with another won ton sheet, trying to eliminate all the air bubbles and pressing with your fingers to seal the edges. 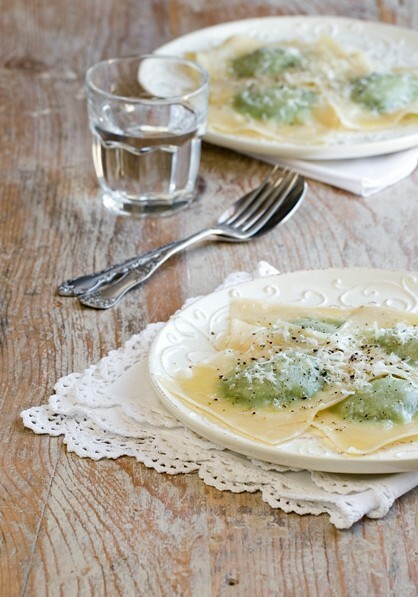 As ravioli are ready, place them on a platter and cover them with a cloth. Cook them in salted boiling water for two minutes or until they come to the surface. Dress them with melted butter, grated parmigiano cheese and a sprinkle of pepper. And so the ravioli are served. Note: Seriously, I was really curious to see the result. Won ton dough has a neutral flavor, and this works in favour of the filling, may it be made with peas, asparagus, cheese or whatever your imagination suggests. The difference is rather in the texture of the wrappers; I might call it stickier, or a little chewier. Nothing prohibits you from using the pea filling for some ravioli ravioli, or as an appetizer, spread on some toasted bread.